Gain nationally accredited training and qualifications in beekeeping by completing a AHC32016 Certificate III in Beekeeping through Tocal College. Applications for the February 2019 intake of the AHC32016 Certificate III in Beekeeping qualification are now closed. Note: This qualification will be superceded in 2020 by the newly released AHC31818 Certificate III in Beekeeping. Tocal College will be updating and developing resources this year for transitioning to the new qualification, and as a result will limit enrolments to 30 places in the current AHC32016 Certificate III in Beekeeping. Successful applicants will be expected to complete all course requirements by 1 December 2019 to gain this qualification. Due to the demand for this qualification, Tocal College has a staged application and selection process. This is a trade level qualification and priority will be given to beekeepers currently working in the bee industry, new full time trainees of commercial beekeepers, and beekeepers seeking to diversify and/or scale up their beekeeping business operations. For beekeepers not requiring the full qualification but wanting to increase their skills, Tocal College continues to offer accredited industry short course training in bees. This qualification is delivered through a combination of face-to-face, online and workplace training and assessment. 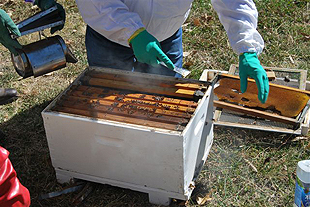 There are practical components with hands on exercises involving bee hives and various beekeeping equipment. You must successfully complete 12 core units and four elective units, as shown in Course details, to attain a Certificate III in Beekeeping. Complete course details can be found in the AHC32016 - Certificate III in Beekeeping. Smart & Skilled Course Fee: This course fee is considered a student contribution to the full cost of training, the difference being subsidised by the State Government. The fee payable depends upon eligibility and access to concessions or exemptions. *More information is available on the Smart & Skilled website.